Customer requested a low cost color system for concrete color admixture that would accurately pump and measure 4 or 5 primary colors into one or more pails. The pails would be then dumped into concrete truck at a later time and at a different location. 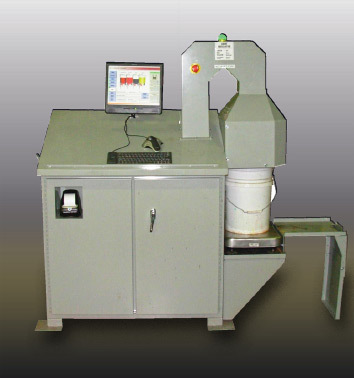 The concept would allow one machine to support several batch plants. Computer for controls and retaining databases including 700 color recipes. Enclosure large enough to contain up to five pumps, electrical controls, computer, label printer, provide enough heat dissipation for a standard desktop computer, and ergonomic work space. Scale as a means to measure the color admixture in the pail. 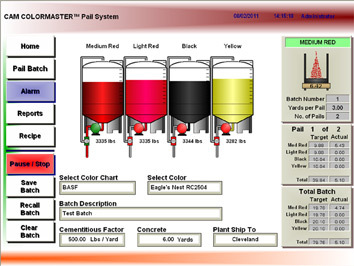 Software that included: graphical representation of the automated batching process; the ability to print a label with detailed information include targets and actual values to be adhered to each pail; ability to calibrate and tune the system or accurate measurement; recipe management; databases for alarms, activity, recipes, and more. EASI designed a custom enclosure and provided a mechanical design.